This has been bugging me for months...maybe even years. I am so baffled by this behavior and, sadly, I've seen it quite frequently. Riddle me this.... here's an example of what I am talking about. You take the time to pack your lunch...separate containers for your lettuce and your dressing...even a container for your slivered almonds to sprinkle on top of that delicious salad. And yet.... you can't pack a fork. WTF is that about? You pack ALL of that other stuff and then you use a plastic fork that you will only use ONE TIME and then it will SIT IN THE LANDFILL FOR ALL ETERNITY (and the folk in this state know ALL about eternity). Seriously, people. Eating off a plastic fork is not enjoyable. Pack a REAL fork. You just might enjoy your lunch that much more. Mother Earth, our dwindling oil supply (i.e. what plastic is made from), and your fellow environmentalists thank you. Oh I love your blog! You guys are so good together. Amazing pictures! I will think of you the next time I am tempted to use a plastic fork.....and I will resist! Love ya! 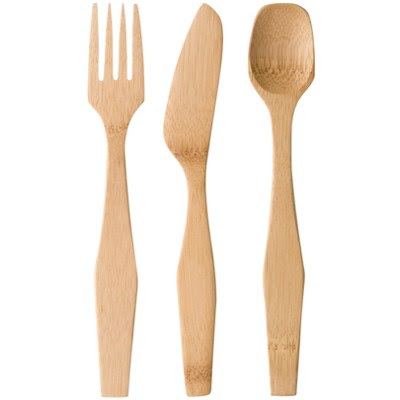 No more plastic forks here! LOL Hooray for Canadians! Just got back from Alberta myself... LOVE it there! P.S. This is probably a weird question to ask but, did your email get hacked into by any chance? Hi Suzi! I'm glad to hear you love Canada, too. Alberta is beautiful! Ummm....I don't know if my email got hacked...did you get an email from me? I only use my gmail now so if it was from my hotmail, sorry!! I need to delete that account!